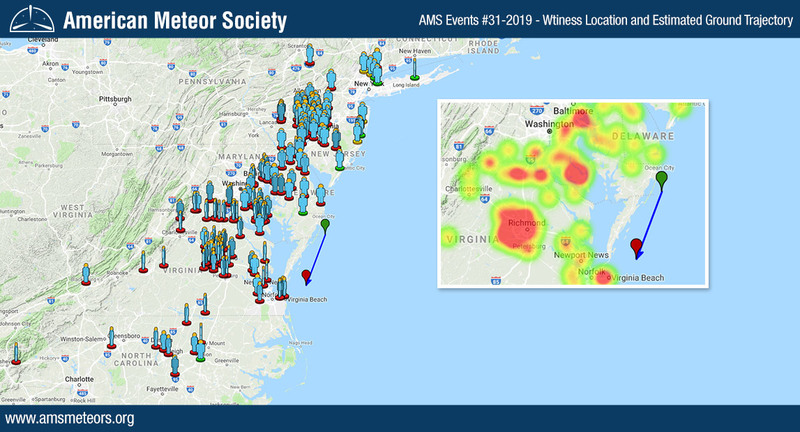 The AMS has received over 575 reports so far about of a bright fireball seen above the East Coast area on January 9th, 2019 around 6:34am EST (11:34 Universal Time). The event was seen from Connecticut to South Carolina. 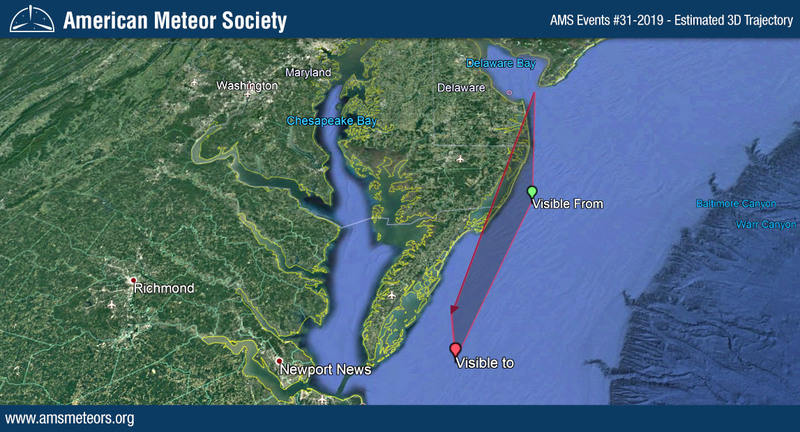 The preliminary 3D trajectory computed based on all the reports submitted to the AMS shows that the fireball was traveling from North-East to South-West and ended its flight somewhere in the Atlantic Ocean North East of Norfolk, VA.
Based on our first analysis, it looks like the event was a fireball. A fireball is another term for a very bright meteor, generally brighter than magnitude -4, which is about the same magnitude of the planet Venus currently visible in the morning sky. Several thousand meteors of fireball magnitude occur in the Earth’s atmosphere each day. The vast majority of these, however, occur over the oceans and uninhabited regions, and a good many are masked by daylight. Those that occur at night also stand little chance of being detected due to the relatively low numbers of persons out to notice them. Additionally, the brighter the fireball, the more rare is the event. As a general thumb rule, there are only about 1/3 as many fireballs present for each successively brighter magnitude class, following an exponential decrease. Experienced observers can expect to see only about 1 fireball of magnitude -6 or better for every 200 hours of meteor observing, while a fireball of magnitude -4 can be expected about once every 20 hours or so. So, if you saw this one: congrats, it’s a nice way start the year! Meteor spotted in Bangor Maine. Streaking south across the eastern sky approximately 5:36 this evening. Very bright moving very fast but not too fast not to see large trailing tail yellow orange in color. Very cool. 4 people from my office observed on commute home. I saw this on 64 east in virginia this morning! Very cool! It was so bright and so fast! I’ve never seen one. I saw it in the same area. I was heading East on 64 past Richmond. I saw that fireball. I was on 309 north heading to Phillie in pa and it was very low. I thought it was gonna land in philly that’s how low it was. Like a plane about to touch down to land. I cant believe it made it to the ocean. I was watching it while I was driving and it was coming down where I was. The way it wavered made me think it might be space junk-Old satellite or something artificial. Hmmmm. I found it informative. Well structured..thank you. I saw a fireball in the sky over Annapolis, Maryland at 649 this morning. Sorry…fat fingers struck again. The tine I saw fireball was 635a on the 9th. Glad so many others saw it too. Magnificent! Were there any radar observations to determine size of the metroroid or incidental spectroscopic observations to determine mineral content? Saw this go right before my car in the way into work. It was beautiful and so bright. It looked like it landed right to the right of my location which was RT.235 California MD. One of my Co-workes saw it at the same time from St. Mary’s College MD. Looks unlike a fireball….no tail no no sparks and wavering?????? For a few seconds i thought it was a ufo! I’ve seen plenty of shooting stars, but never one this bright. Amazing!! plus i didn’t know you could report seeing them till i looked for confirmation of what i saw. so i learned a bunch of neat stuff today too. I saw this at 6:35 this morning on my way to work. I live in the lower Hudson Valley of NY but was near the Northern New Jersey border. Great sight! First meteor I ever saw. Thought it was a shooting star at first but it was way too large for that. Spotted east of Fredericksburg VA. It looked like it fizzled before it went out of sight. I won’t lie, a little worried about impact. You were right, not a bad way to start the year. Wished to win the lottery. Need to buy a ticket. Happy New Year! I saw it in NE Philadelphia this morning. Absolutely amazing!!!! I seen this also in Woolford Md on my way to work. It was beautiful. I saw it while on my walk before work this morning! In west orange NJ. Absolutely amazing! I hope it’s a sign of good fortune for the new year! I seen this bright white, slow falling light looked like it was flling straight down. Jnwas leaving for work, leaving my driveway in Little Falls, NJ. Facing South towards Verona. That was facinating. I was wondering all day what it could have been that I seen. I saw it this morning on my way to school, my dad saw it as well, I kept telling my friends this morning but didn’t really believe me glad I’m not the only one who saw it it really was cool. I saw it too in Petersburg. It was amazing! I commented below. Robert L.
I reported my sighting when I read there were no reports north of N.Y.. I saw it bright and clear from Stratford CT. Driving to the train. Saw it from my car in Middlesex County NJ. I saw this in Virginia Beach, VA. Caught it with my Ring camera. Never seen anything like it!!!! Thanks all. I’d love to catch one some day. Waiting for the school bus when I saw it fly out of the corner of my eye. Definitely a great experience! I saw this huge white light with about 15 other people and it was so close and so big we thought a plane was crashing. It looked like it was barely above the ground heading southwest in Petersburg Virginia. It went by us slowly and flicked down to a tiny red dot right in front of us and disappeared before it left our view. It was absolutely amazing!!! I was driving ~SW in the right lane of route-347 in St.James NY (Long Island) just about to turn west. A pickup truck was in front on me blocking view and then it moved to the left lane. Dead ahead I saw this VERY bright light high up in the south going straight down at incredible speed. It was dark and hard to judge distance, but it was so bright that it appeared large enough to be an airplane. Meteor did not even occur to me since I saw no trail (and I never saw one so bright). I was under the impression I was heading exactly south but checking the map shows it was exactly in the direction of this fireball. To me it appeared to go straight down from high up directly down to the horizon. My 1st thought was that this was an aircraft and I was going to see an explosion (MacArthur airport is exactly south ~8 miles). However, it was going so fast that it would have to be an intentional nose-dive at full speed. And the approach angle to the airport just did not seem right. (where i would have sworn it abruptly stopped it’s plunge, and immediately turned west on a dime, but with my driving, head turning, and the darkness I am sure I was mistaken). All I could think is ‘what the hell did I just see?’. I picked up my phone and checked the time- 6:35. I am sure if was an airplane I would soon see it on the news. But then I had a bit of angst when the thought that this could have been something really big that just fell down out in the ocean (thoughts of massive a tidal wave in my head). I did not tell anyone about it and did not see anything in the news. How could no one have seen this? I was in tight traffic headed south with 50+ cars all around me in four lanes. I told my wife about it that night because it was coincidentally funny that she was playing goofy you-tube UFO conspiracy videos on the TV the night before (not something we usually do). I told her I had no idea what it was. She decided to search and found your report! I am so glad I was not all alone in seeing it. I was very into astronomy in my teens but have not really been doing anything related in 30+ years. Never heard of these ‘fireballs’. I can spot Jupiter, Venus, Mars etc. when in the sky without assistance easily enough. I see it was compared to Venus in brightness but my thoughts were that it was more like Jupiter but allot brighter; comparing it to Jupiter because it had more ‘presence’ than Venus, appearing so large. The Settle video made 58 miles west of my position is pretty much the same way I saw it fall, but does not do it justice (perhaps due to the city-glare). I saw it too in Coatesville, Pennsylvania. So bright. I could not believe my eyes and walked down the driveway to see if something crashed. So exciting. I saw it driving to work on 202 south in Blue bell. Pa.about 6 :30 ish .At first I thought a plane was going down .it went straight across the horizon for about 4seconds .Truly an amazing sight ,that was the first one of that size I have ever seen looking ahead to a great year! Walked out my door at 5:38 am and saw it streak across the sky heading east leaving a trail about a mile long. Live on long islands east end. I saw it in Philadelphia PA at approximately 6:38am on 1/9/2019 while driving to work. At first I thought it was a plane falling out of the sky or a UFO ( which I don’t believe in)! As I considered what I just saw, I concluded that it must have been a meteor, though different from any that I have ever seen before. It was moving so fast and bright with no trail behind it. Many years ago I viewed a spectacular meteor shower- this was unique which explains why it’s a fireball. Amazing experience! I just stumbled across this post. I saw this from my bedroom window in Riva, Maryland yesterday morning looking south. From my vantage point north of it, it appeared above the trees and looked bright and large. At first I though it must have been a bright helicopter because it appeared in my view above the trees and looked like it lifted but shot away from me toward the south so fast and bright that it could not have been a helicopter and was gone in about two seconds. I saw it while driving South on rt 13 approaching Smyrna, Delaware. It was spectacular! Definitely an amazing way to start the year. Thanks to everyone for sharing your experience and video! 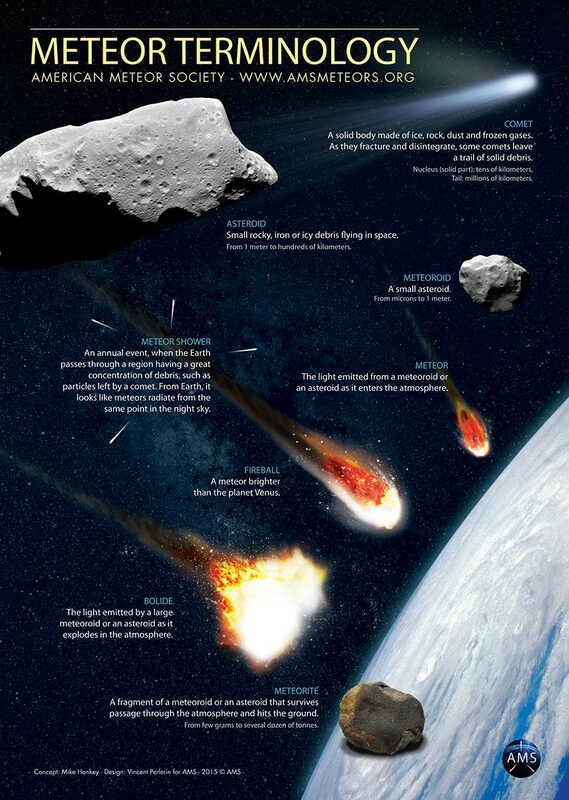 In the early morning hours,my fiance and I were out side looking up at the sky in Coventry Rhode island,looking towards the south and Connecticut and we saw a bright object that looked like a meteor fly through through the sky ! It looked different from all the shooting stars we have seen! We thought there was something crazy like a meteor! WOW!!!! What a great sight to see!!! The sky and beyond is absolutely fascinating!!!! Did any other Rhode islanders get this wonderful opportunity to see this? I saw the blue green fireball on my way home from work tonight 1/16/19. Echo Lake, Mount Desert island, Maine. So cool! I saw this at 12:45am on the night/morning of the Total Lunar Eclipse, January 21, 2019! In Clemson, South Carolina! It was an amazing site! I could easily see the fire of the meteor and for a few hours thought it was a plane crashing and burning!